What is it about Sunday afternoons? Is it the dreaded glance at a pile of untouched papers on the table corner that provokes anxiety? Or is it the realization that in less than twelve hours, it will be Monday morning all over again? I’m not wearing my watch but I can hear the ticking of a clock somewhere in The Coop. It’s not the slow, steady tick tock of a grandfather clock or a cuckoo clock. It’s the digital press of time, saying “68 days, 68 days, 68 days.” I have 68 days to pack up the contents of The Coop and move. I’m excited about this opportunity. After all, moving closer to my family and friends has been a dream I’ve written about here and elsewhere for a long time. A month ago, I rented a storage space at home and started moving a few things at a leisurely pace. I wasn’t sure how things were going to work out, but I figured being prepared to move couldn’t hurt and there were many things I didn’t use every day which could easily be stored. 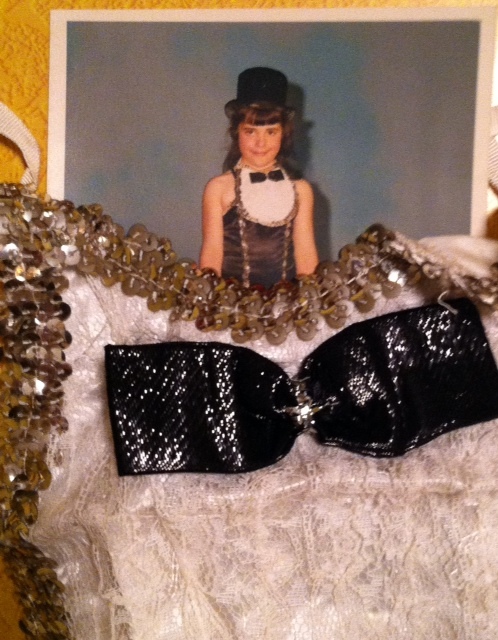 I never forgot my tap steps in the three years I was a dancer at the Clara Harnden-Desjardins School of Dance. The show went on. As I’ve started sorting through the papers and souvenirs in my spare bedroom, I’m finding all kinds of treasures like this. Mondays can be “Moving Monday” and I’ll dredge up curiosities from The Coop’s archives. I have a lot of new things to do in 68 days and I also have a lot of things that I have to keep doing. I have my job, I have to help everyone get “rooted” at The Hampton Victory Garden, I have gardens to plant at home, there are Moxie Festival tasks to accomplish, and blog posts to write. There are probably ten other things I’ve left off that list. To accommodate my moving tasks, I’m going to temporarily shuffle out one less blog post each week. I’m going to blog on Monday, Wednesday, Thursday, Friday, and Sunday. No post on Tuesdays, because I’ll be tap dancing things into boxes. Yup, that’s what I’m going to do. It was a tough decision because I like writing; sometimes a person has to postpone enjoyable things in the short term to accomplish something better in the long term. Moving home is that something better for me. The show must go on, no matter what. See you back here on Wednesday. This entry was posted in Experiments and Challenges and tagged change is difficult, Clara Harnden-Desjardins School of Dance, moving, when dreams become reality. Bookmark the permalink.